Mama Marcie: Happy Birthday, Mom! Today, we celebrate the birth of an incredible woman - my mom. I am a very lucky girl. My mom is fun, kind, generous, loving, extremely patient, and has always been there for me. We have always been close, but now that I am a mother as well, we are truly friends. She is the youngest of five kids and grew up in church from the time of conception. She always taught me what it meant to be a lady and especially a woman of God. There are so many things she taught me as a teenager that I hated to admit she was right, but now, I am so grateful for her guidance and support. She raised me in a Godly home, but let me make mistakes, and she was always there to listen and dry my tears when my way turned out to be the wrong way, which it so often did. And in the past 9 months, she has transformed into so much more than my mom... She is now Nana to my daughter, and I wasn't sure if it was possible for her to love anyone more than my sister and I, but her eyes literally twinkle when Isabel is around. Together, they play, they read, they talk, they learn, they take naps, and they have grown such a special bond similar to what I have with my grandmother. It is so special, and I am so thankful that they get this time together. The photo on the bottom right is my mom with my Papa, her father in law, when she found out she was pregnant with me. I love how happy she looks in this picture. She was young, and I know how many crazy emotions I felt when I found out I was pregnant... But here, she just looks happy. The picture on the left is Nana with her grand baby the first week we were home from the hospital. I can not tell you what an incredible help my mom was that week. I honestly do not know what I would have done without her! 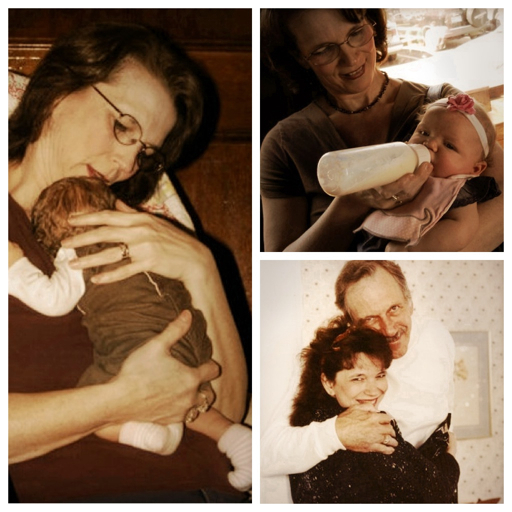 And finally, the photo on the top right is of my mom with Isabel on the day of her dedication at church. This picture embodies the definition of proud, and makes me tear up a little with gratitude that there is someone (several someone's actually) that love my little girl as much as me. Happy birthday, mom. Thank you for being an awesome mom, and an even better Nana. I am so thankful for you!